I tackled my most difficult #KonMarie decluttering session yet over the weekend. It was, in fact, the whole reason I started cleaning stuff up in the first place: my knitting WIPs and notions. I keep most of my knitting needles, notions, and assorted paraphernalia in 2 small plastic drawers and a basket, all of which were crammed tight and overflowing. All of my WIPs are kept — honestly, all over the place, but theoretically organized in another set of plastic drawers. I had them sorted by year started (which was super depressing) but then shuffled things around into three categories: socks, shawls, and ‘other’ (encompassing mitts, cowls, scarves, a blanket, etc.). And most importantly, I ruthlessly frogged things that no longer sparked joy. I have to admit, decluttering feels really good, and it’s helped me re-focus my knitting efforts. I picked up an old sock WIP that had just one leg done that I’d like to finish by Mother’s Day (one of my Second Quarter goals), and I’m already at the heel on both socks. Turns out, socks are super speedy when you actually work on them. WHO KNEW?! Speaking of actually working on projects, check out my top 5 ways to procrasti-knit over on Stef’s blog! 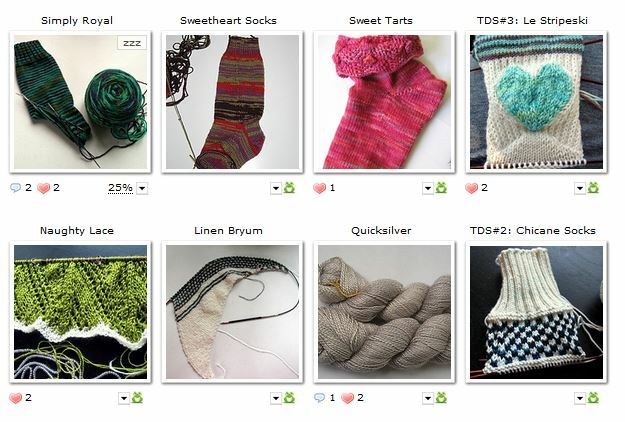 This entry was posted in 2015secquart, blogland, destash, knitting, life and tagged frogging, knitting, KonMarie, socks by shoelaceswitcher. Bookmark the permalink. I think that we have both knit many more pairs of socks in our heads than actual socks. I also rediscovered this weekend how knitting grows when you knit it. haha yes, it blows my mind when I feel like I have no socks to wear b/c most of them are unfinished! Counting them up like that really makes me want to finish them, though. Well done you. It does help to get rid of WIPs you’ll no longer knit. I have a rule of doing that now. The ones I keep are the ones I am going to knit. Now you have lots of yarn that you can use in other things!! What a fantastic thing to do – I desperately need to do this myself, oh, time! Wow, very impressive! I could really stand to declutter, but can’t seem to make the leap over to KonMarieLand just yet. It’s been really inspiring watching my fellow knitters take the plunge, although the pack rat in me is having a hard time joining them! I love honesty about stash and disorganization — both of which reign in my crafting life! I need to take a page out of your book and de-clutter, but not just now. And thanks for sharing the secret about how to make progress on socks. Who knew indeed?! Yay for getting the WIP’s under control. I hope it leads to knitting more stuff that you really love.